Lentil Loaves.....swoon. I may be an omnivore, but when it comes to a lentil loaf I can't get enough. My first introduction to it was when I was shopping in Portabello market in London on a Sunday. Being a Sunday, we slipped into a nice pub and ordered a Sunday roast. Being very out of character for me, I was struck by the nutty, almost thanksgiving stuffing like flavours of the vegetarian lentil loaf option. Since that experience I've been trying to recreate it in my own kitchen because it was so fabulous. This recipe is a modified version of the 'Oh She Glows - Ultimate Lentil Loaf'. It just so happens to be vegan, but if you wanted I'm sure you could throw in an egg to help with binding (although it really doesn't need it if you allow it to rest). This one is perfectly savoury with garlic, rosemary and celery, has just enough texture with walnuts, creamy due to the chestnuts and just a little hint of sweetness from a handful of cranberries. Follow this recipe very carefully to avoid it being crumbly. I highly recommend letting it sit for the directed amount of time before slicing. Serve with a herby garlic aioli and blow the socks of vegetarians and carnivores alike. Quick and delicious chocolate mousse made with 3 ingredients you probably already have on hand. Omelette's are the perfect way to start the day. First thing they are made of eggs, which in my opinion is a perfect whole food with a wide spectrum of nutrients, including choline (brain health, metabolism, energy...). Also, you can stuff it full of yummy vegetables and you don't really need to eat it with refined flours or bread which may throw off your blood sugar balance in the morning. Did you know that two slices of BROWN toast have the equivalent effect on your blood sugar levels as 6 teaspoons of sugar! (Based on Glycemic Load number). When I say omelette, I'm not talking about that super greasy, brown bottomed, rubbery Western Omelette from your local truck stop diner. 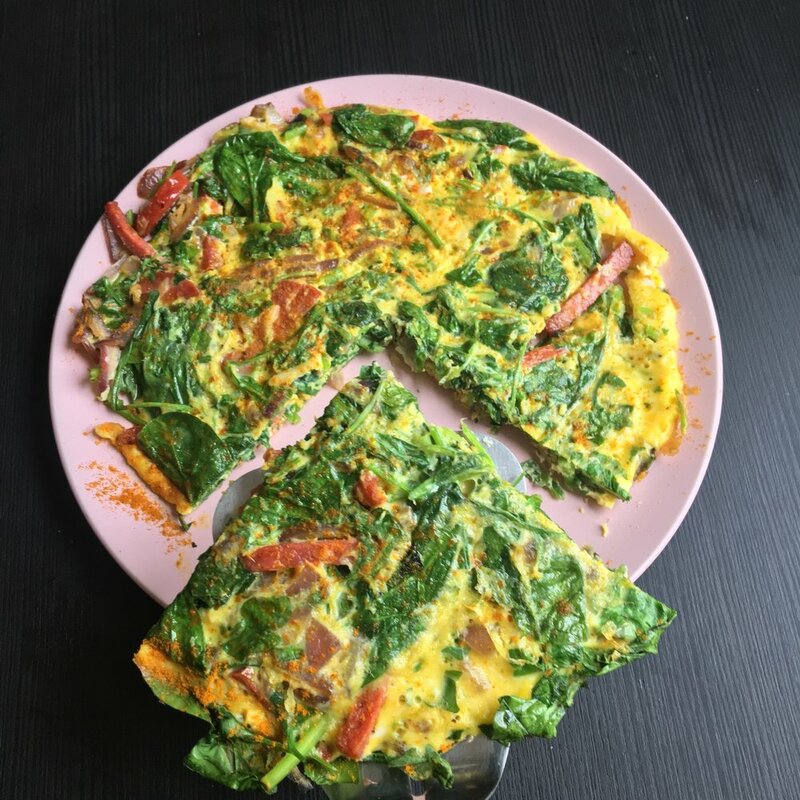 I rarely eat omelettes when I go out because I'm almost always disappointed and have found a way to perfect it at home, and so can you. So how do you make the perfect omelette you ask? Like anything, it starts with the best ingredients. Since the recipe is so simple, the eggs especially should be top drawer because the flavour really shines through rather than being smothered in salt, strong spices or overpowering cheeses. The fresher the better. If you don't have access to farm fresh eggs, choose organic which will ensure they are antibiotic free, cage-free and not fed animal by-products. Slow and Low Baby: Be kind to your eggs. Heat them gently on medium-low heat and take your time with it. This will result in fluffier eggs that are not rubbery. Use Butter, But Not Too Much: 1 tsp of butter is enough for two whisked eggs. Any more will weigh down the texture and become greasy. If the butter sizzles, the heat is too high. Whisk with Love: Gently but thoroughly. Avoid brisk whisking which can add too much air to the omelette. You want to take your time making sure it's fully incorporated and uniform in colour. One at a Time: No more than three eggs per omelette and one at a time. Sorry if you have big families that want to eat all at the same time, but it's simply not going to happen. Each one needs the right size pan to receive all of your attention as timing is everything. Tilt the Pan: A few minutes after you add the egg to the pan and the bottom begins to solidify, with a spatula start lifting the sides and tilting the pan so the runny egg sneaks underneath. This will ensure you don't burn the bottom and the top cooks as quick as the bottom. Keep the Pan Moving: Jiggle the pan so the bottom doesn't burn . Heat a non-stick skillet to medium heat. Slice the leeks, chilli pepper and cheese. Place butter in the pan and swirl until it covers the surface but doesn't bubble. Add the leek and chilli to the pan and gently saute for about 3 minutes until slightly coloured, stirring often. Gently whisk the eggs in a bowl with a fork for 3 minutes until well combined. Add a pinch of salt and herb de provence. Remove the vegetables from the pan and set aside. Lower heat to medium-low and remove pan from the heat. Add 1 tsp butter and swirl until coats the pan evenly with out sizzling. Poor the whisked egg into the pan and return to the heat. As the egg begins to coagulate, start to jiggle the pan to prevent it from sticking. Using a rubber spatula, run it along the edges. Lift the edge and tilt the pan to allow any runny egg to sneak underneath. Continue this process until the top is no longer runny. At this point you can place a large lid on top for a minute or two to cook the top a bit more. Add the sauted vegetables to one half of the omelette in the shape of a half moon, spread out. Add the cheese in the same way, avoiding getting too close to the edge. At this point you want to fold it in half. Using the spatula run it along the sides and jiggle the pan to make sure it's not sticking in any place. Slip the spatula underneath the omelette as far to the other side as you can get. With confidence fold the omelette in half, aiming for one edge to meet the other like a little pocket of cheesy amazing. Continue to cook on medium-low for another minute or two. You can lift the flap to check if the cheese has melted. As soon as it's melted, transfer to a hot plate and serve. Lentils are a brilliant way to add fibre to your diet. Of all the legumes out there, they appear to be the most tolerable where gas and bloating is concerned. Since it is such a nutrient dense little legume boasting a high source of calcium, phosphorus, iron and B vitamins, we often see it in many cuisines world over. It can be paired with rice to create a complete protein in vegetarian diets, or as my mom used to serve it, paired with pasta in a 'Cucina Povera' peasant dish from Sicily called "pasta con lenticche'. Due to its rich iron content, it was often served a couple times a month to correct iron deficiency in times of menstruation. To make lentils more tolerable on the digestive system, plan ahead and soak these guys on the counter top for 1-2 days. IF you have the foresight, it will pay off and your tummy will thank you. This recipe is warming, earthy, hearty, rich and delicious. A perfect grounding dish for the cold winter months. The good thing is it's quick and easy. No need to fry , just pop everything in the crockpot and let it do its thing. Add everything to a crock pot and set to high. Cook for 5 hours, or until the lentils are soft. If using bone marrow, make sure it has softened and can be pushed out with a knife. Serve with fresh basil, enjoy! This is my favourite 5 minute pasta inspired by the mighty 'spaghetti al limone' from @terronito. Here's today's version (changes based on fridge supply). Add spinach to pan to wilt at the last minute. This salad is only to made in the summer, when the tomatoes are real, preferably from the farmers market. Not genetically modified, uniform, seedless, small hard tasteless tennis balls. This salad originating in Tuscany is a classic example of "Cucina Povera" aka cuisine of the poor. It takes a few simple yet delicious ingredients and revives old stale bread, highlighting the integrity of each ingredient. Juicy plump tomatoes give stale bread a second life and saves it from the bin. If you have fresh bread, you can lightly toast it with olive oil and salt. Roughly slice tomatoes into different sizes. Using your hands, add everything in a bowl, and mix up, lightly squeezing the tomatoes to release their juices and coat the bread. Fettuccine Con Fiori di Zucca RecipeNothing excites me more than making a quick pasta at the height of the summer season. When the famers market tables are gorging with the earths bounty, every colour in the rainbow is on display, and vegetables are plump and ripe from the warm summer sun. You know the flavour will be bursting and every dish you make will be spectacular. This dish was inspired by the many squash blossoms growing in my garden. After a small battle with the bees, I was able to harvest the blossoms, carefully rinse them and prepare them for the dish. The idea was to stay light and simple since squash blossoms have such a delicate flavour. I gave a bit of depth to the dish with toasted pine nuts and Ontario cheddar cheese. Here is the recipe! In a medium pot of salted boiling water, add fettuccine. In a large saucepan on medium heat, using half the amount of coconut oil, sauté the onions until soft and translucent. Set aside. Using the remaining coconut oil, on medium high heat, sauté the squash until slightly brown, sprinkle with salt to encourage browning. Set aside with onions. Add shaved garlic and continue cooking. While this is cooking, lightly toast pine nuts in a small non-stick pan for 2 min. When pasta is ready, add to pan along with squash blossoms, onions and squash, pine nuts and basil chiffonade. Drizzle with olive oil and mix to combine. Finish with freshly shaved cheddar cheese.